Looking for a quick no-cook appetizer that serves a crowd? 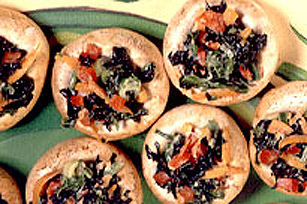 Give our simple stuffed mushroom recipe a try. These Zesty Mushroom Caps are easy and delicious. WASH mushrooms, pat dry and set aside. Mix remaining ingredients together; stuff mushrooms. COVER and refrigerate until serving. Remove from refrigerator 30 minutes before serving.